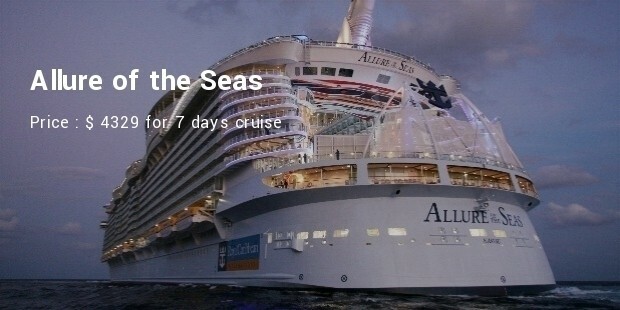 If you are planning to take a holiday cruise and have plenty of cash lying around why not go for the best cabin ( suite ) on the ship , of course they are not called Cabins at this level but known as SUITES. What exactly can a person expect from the best accommodation at sea. 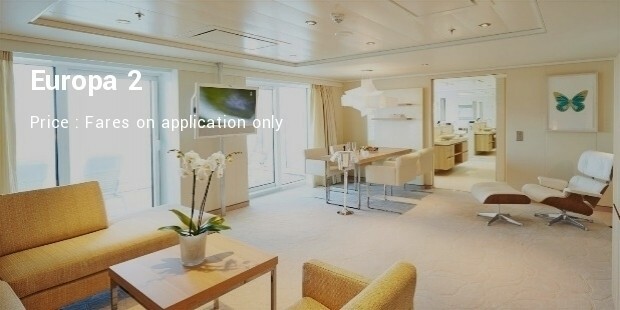 The top Suites usually have a sparate sleeping and living spaces while they may vary from ship to ship. A butler should be available 24/7, to show you how everything works, unpack your clothes, organise shore excursions, and serve canapés and cocktails in your suite. Amenities usually include designer-name bathroom products, a pillow menu, Egyptian or Italian bed linen, fresh flowers and fruit baskets that are replenished daily, plus your choice of drinks stocked in the fridge. 1. 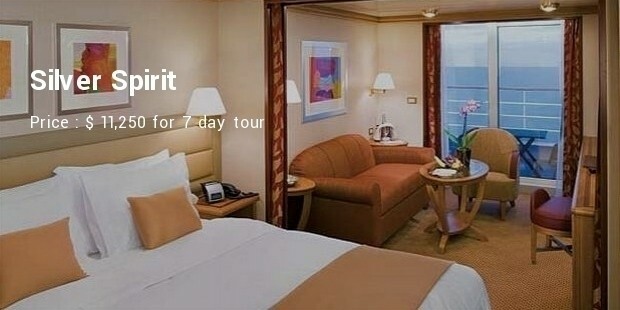 Silver Spirit – Owner's Suite – Expect $11,250 for 7 day tour. 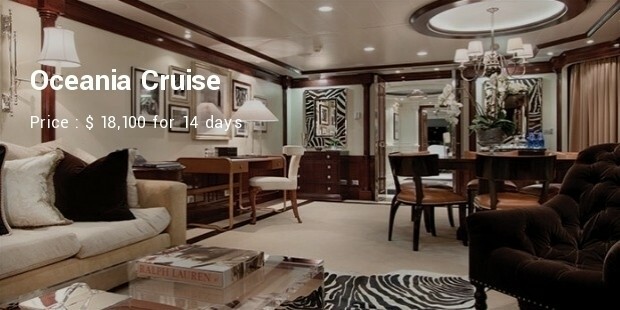 Silversea's newest ship, the 540-passenger Silver Spirit, has two Owner's Suites. At 120 square metres (including the balcony), they are sleek, sophisticated and spacious; and they can be made even more spacious when configured as a 150-square-metre, two-bedroom apartment with the adjoining Vista Suite. 2. 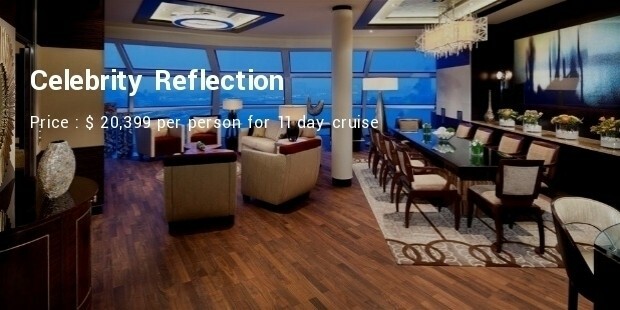 Sea Dream I & II , Owner's Suite – Expect $8099 for 5 day cruise. The passenger 'mega yachts' are not the biggest at sea but the sophisticated-casual sensibility extends a wonderful luxury that really makes you feel as though you're sailing on a private yacht. There are 10 double Balinese Dream Beds aft of the Top of the Yacht Bar and one huge bed forward, which are made up with fine linens. Personalised pyjamas and a bottle of champagne are provided. 3. 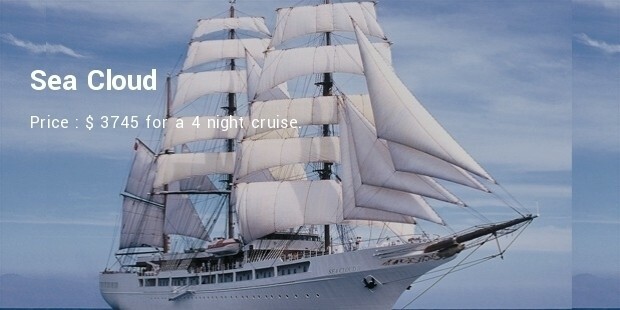 Sea Cloud – The Owner's Suite – Marjorie’s - $3745 for a 4 night cruise. This romantic, four-masted windjammer was built for Edward Hutton and his wife, Marjorie Mereweather Post, in 1931. The husband and wife owner's suites have been lovingly restored over the years and still feature the original, lavish furnishings. Edward's suite is slightly smaller, and the wood-panelling gives it an appropriately masculine, 'clubby' ambience. 4. 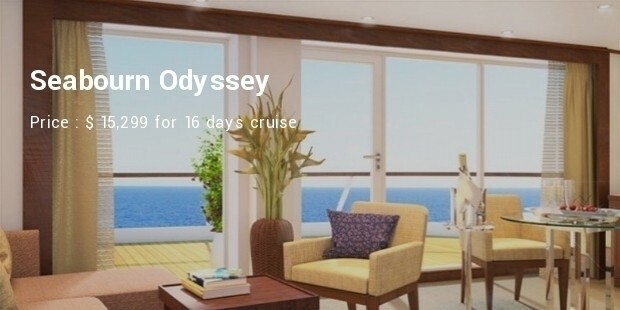 Seabourn Odyssey – Penthouse Spa Suites - $15,299 for 16 days cruise. 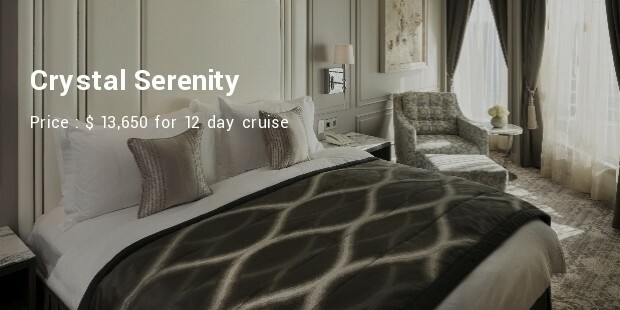 Seabourn has introduced four elegant Penthouse Spa Suites to Seabourn Odyssey just in time for the boutique luxury vessel's upcoming Australian summer visit. Penthouse Spa Suites have spacious balconies, living and dining areas, a bathroom with special spa shower and a minibar stocked with healthy snacks and juices. 8. 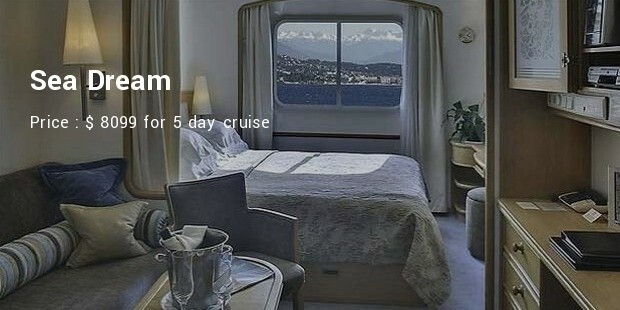 Crystal Serenity – The Crystal Penthouse with Verandah - $13,650 for 12 day cruise. 9. Queen Mary 2 – Queens Grill Grand Duplex - $ 26,069 for an 8 night cruise. The Cruises on Luxury boats , super pampered rich guests are the lucky ones to get an opportunity to enjoy them.